Bread wheat is one of the world's three main cereal crops, along with rice and maize. The generic name Triticum derives from the Latin for threshing or bruising, and the specific epithet aestivum is from the Latin for summer. Alt. 2000 - 3000 m.
Annual; caespitose. Culms 60-100 cm long. Culm-internodes thin-walled. Leaf-sheaths glabrous on surface, or pubescent. Leaf-sheath oral hairs ciliate. Leaf-sheath auricles falcate. Ligule an eciliate membrane; 1 mm long. Leaf-blades 10-60 cm long; 10-15 mm wide. Leaf-blade surface pubescent. Inflorescence composed of racemes. Racemes 1; single; linear, or oblong; bilateral; 5-18 cm long. Rhachis tough; flattened; glabrous on surface; ciliate on margins. Spikelet packing broadside to rhachis. Rhachis internodes oblong; 2-3 mm long. Spikelets ascending; solitary. Fertile spikelets sessile. Spikelets comprising 2-4 fertile florets; with diminished florets at the apex. Spikelets ovate; laterally compressed; 10-15 mm long; 9-18 mm wide; persistent on plant. Rhachilla internodes 1-1.2 mm long. Glumes similar; shorter than spikelet. Lower glume ovate; 6-11 mm long; 1 length of upper glume; coriaceous; 2-keeled; keeled above; winged on keel; winged above; 5-9 -veined. Lower glume surface glabrous, or puberulous, or villous. Lower glume apex with a unilateral tooth; truncate; muticous, or awned; 1 -awned. Lower glume awn 0-40 mm long. Upper glume ovate; 6-11 mm long; 0.5-0.7 length of adjacent fertile lemma; coriaceous; 2-keeled; keeled above; 5-9 -veined. Upper glume lateral veins divergent at apex. Upper glume surface glabrous, or pubescent, or villous. Upper glume apex with a unilateral tooth; truncate; muticous, or awned; 1 -awned. Upper glume awn 0-40 mm long. Fertile lemma ovate; 12-15 mm long; chartaceous; keeled; keeled above; 5-9 -veined. Lemma apex acute; muticous, or awned; 1 -awned. Principal lemma awn 0-150 mm long overall; limb scabrous. Palea 2 -veined. Palea keels winged; conspicuously winged; ciliolate. Apical sterile florets resembling fertile though underdeveloped. Anthers 3. Ovary with a fleshy appendage below style insertion; pubescent on apex. Caryopsis with adherent pericarp; oblong; sulcate on hilar side; 5-7 mm long; hairy at apex. Hilum linear. Europe: northern, central, southwestern, southeastern, and eastern. Africa: north, Macaronesia, west tropical, west-central tropical, northeast tropical, east tropical, southern tropical, south, and western Indian ocean. Asia-temperate: Siberia, Soviet far east, Soviet Middle Asia, Caucasus, western Asia, Arabia, China, Mongolia, and eastern Asia. Asia-tropical: India, Indo-China, and Malesia. Australasia: Australia and New Zealand. Pacific: southwestern and north-central. North America: Subarctic, western Canada, eastern Canada, northwest USA, north-central USA, northeast USA, southwest USA, south-central USA, southeast USA, and Mexico. South America: Mesoamericana, Caribbean, northern South America, western South America, Brazil, and southern South America. Cultivada en Colombia; Alt. 2000 - 3000 m.; Andes. Triticum aestivum is a cultigen (a plant that has been altered by humans through a process of selective breeding) and as such is only known in cultivation. First domesticated at least 9,000 years ago, its origins have been the subject of intensive botanical and genetic research. It is a member of the grass family (Poaceae), which includes cereals such as rice (Oryza sativa), maize (Zea mays) and oat (Avena sativa), and ornamentals such as pampas grass (Cortaderia selloana) and bamboos. There are about 5,000 cultivars of bread wheat in current use. Historically, about 35,000 cultivars have been developed, but the vast majority of these are no longer cultivated on a commercial scale. 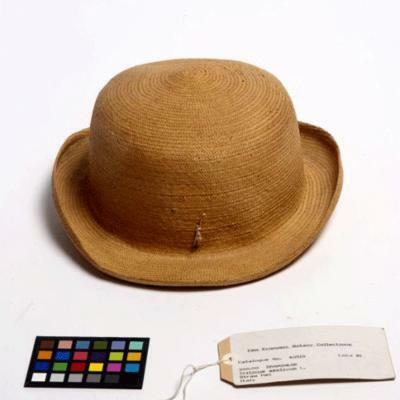 In order to determine whether a particular form of bread wheat differs enough from existing cultivars to be named as a new one, the 'DUS test' is applied. They must be Distinct (in morphology), Uniform (the whole field must look the same) and Stable (subsequent years of cultivation must produce similarly looking plants). Names relating to particular cultivars include bukshee wheat, lammas wheat, Talavela wheat, velvety awned wheat, and many others. Bread wheat is the result of a cross between a wild goatgrass, Aegilops tauschii , and a cultivated wheat, probably macaroni wheat ( Triticum durum ). Genetics suggests this cross took place in the Caspian region of Iran; archaeology suggests that this took place about 9,000 years ago. The closely related spelt wheat ( T. spelta ), in which the grains are enclosed by a tight husk, originated in central Europe much more recently, about 5,000 years ago, from a cross between cultivated bread wheat and emmer wheat ( T. dicoccum ). Spelt wheat is often incorrectly described as a biblical wheat, but it was never grown in the ancient Near East. Bread wheat is cultivated in every continent except Antarctica. It is grown at a wide elevational range from 260 m below sea level in the Jordan Valley up to 4,000 m on the Tibetan plateau. Although it is possible to grow bread wheat in a wide variety of soil types and climates, it is generally more successful in dry to sub-humid areas with a seasonal annual rainfall of 250-750 mm. It is the world's most widely planted crop, occupying 225 million hectares in 2009 (compared with 161 million ha of rice and 159 million ha of maize in that same year). China and India are the largest producers of bread wheat, nearly all of which is destined for their domestic markets. Overview: An annual, largely hairless grass, producing a spike (flowering and fruiting part) on each of its 1-5 culms (stems). Height is variable, from about 1.2-1.5 m for 1930s cultivars to about 85 cm for most modern cultivars, with a simultaneous strengthening of the culm so as to bear the increased weight (resulting from the increased grain yield) of the spike. This has been achieved by incorporating dwarfing genes, from Japanese cultivar Norin 10 , into most modern (post 1960s) varieties. The shorter height of modern cultivars enables them to be grown with fertiliser and irrigation; otherwise they would grow too tall and fall over (lodging). Culms (stems): Hollow with hairless or hairy nodes. Each culm bearing around six leaves with blades up to 20 mm wide and up to 35 cm long. The position of the uppermost 'flag leaf' blade (upright, semi-nodding or nodding) is an important character as it plays a leading role in the metabolic assimilation rate and hence productivity of the plant. Spikes (flowering and fruiting parts): Up to 15 cm long, almost square in cross-section, with 2-5 rudimentary spikelets (clustered units of flowers and bracts) at the base of 10-25 fertile spikelets (of which the number and density in the spike varies greatly among cultivars). Glumes (empty bracts that enclose the spikelet) are keeled in the upper half, the keel extending into a tooth. Lemmas (bracts) are toothed or awned; when awned these increasing in length up to around 13 cm near the apex of the spike. Truly awnless bread wheat cultivars do not exist as there is always at least a short awn on some of the lemmas. Seeds: Typically an average of two per spikelet (but significant variation has been recorded), oval in shape with a central groove on the ventral surface and a terminal tuft of hairs. Endosperm mealy (or sometimes flinty). Agricultural, as opposed to botanical, terminology In agricultural terminology, culms are known as tillers , spikes as ears and awns as beards . For example, a cultivar might be described as having 'four tillers per plant and bearded ears'. Rather than quoting variation in number of grains per spike, agricultural cultivar descriptions are more likely to include the average 1,000 seed weight. A third group, known as facultative or intermediate wheat, can be grown under a wider range of environmental conditions and combines characteristics of the other two groups. Swedish botanist Carl Linnaeus used the name Triticum aestivum to refer to the (conspicuously awned) summer or spring wheats, whereas he proposed T. hybernum for the ('awnless') winter wheats. In the late 18th century, German priest and botanist Franz von Paula Schrank observed that there was no correlation between the perceived presence or absence of awns and the cultivar being a summer or winter form of wheat. It is now accepted that summer, spring and winter wheats are all the same species, for which the correct, approved name is Triticum aestivum . About 250,000 samples of bread wheat are held in agricultural gene banks around the world, so the plant is far from being threatened. However, there is cause for concern in terms of bread wheat landraces, which are being replaced by modern cultivars and under threat of extinction if not already conserved in ex-situ collections. 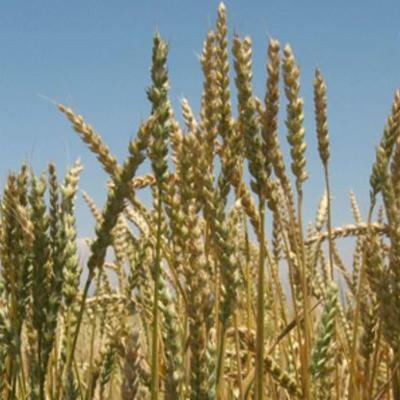 Wheat landraces are varieties that have been developed by farmers over many years and through natural and human selection have become adapted to local environmental conditions and management practices. These distinct plant populations are named and maintained by farmers who often rely on them to fulfil their specific, local needs and are a valuable source of biodiversity for possible use in breeding programs. Domestication of wheat around 10,000 years ago is credited with enabling the transition from nomadic, hunter-gatherer lifestyles to formation of the first major human settlements. Today, wheat is an important part of the human diet, contributing 20% of all food calories consumed by humans. The wheat kernel or grain can be ground into flour; germinated and dried creating malt; crushed or cut into cracked wheat; and parboiled (or steamed), dried, crushed and de-branned to create bulgur (also known as groats in countries including Georgia in the Transcaucasus). When grains are milled, the outer husk or bran that encloses them becomes a by-product. Wheat bran contains starch, protein, vitamins and minerals, and its dietary soluble fibres are good for the digestive system. It is used to enrich bread and breakfast cereals and foods such as borscht soup in eastern Europe. Bread wheat is a major ingredient in foods such as breads, crackers, biscuits, pancakes, pies, pastries, cakes, sauces, muesli and breakfast cereals. Wheat gluten allergy (coeliac disease) is a condition caused by an adverse immune system reaction to gliadin, a gluten protein found in wheat. The only remedy is a lifelong gluten-free diet. Wheat is used to produce boza (a fermented beverage, produced mainly in the Balkans and Turkey) and wheat beer (production of which is minor compared to beer made using barley). It is also distilled to produce vodka and other spirits. Bread wheat straw is used for thatching and weaving, for example to make straw hats. There is anecdotal evidence from the Yemen where the tall, flexible culms of local cultivars are of more monetary value than the grain, due to their use as thatch and, when chopped-up, as admixture to enhance the strength of plaster for houses. Farmers are therefore loath to accept yield-improved but short-stemmed, modern varieties. As a result most grain used in Yemen is imported from Australia. Wheat bran has been used for tanning leather and is apparently also a good slug 'poison' (it swells so much after ingestion that the slugs 'pop'). 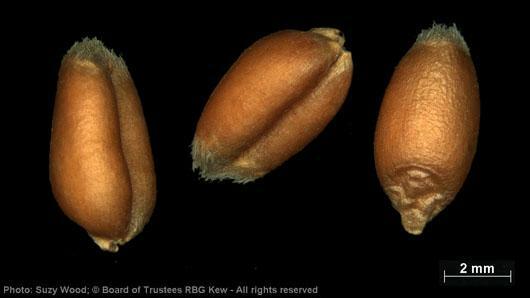 Six collections of Triticum aestivum seeds are held in Kew's Millennium Seed Bank based at Wakehurst in West Sussex. 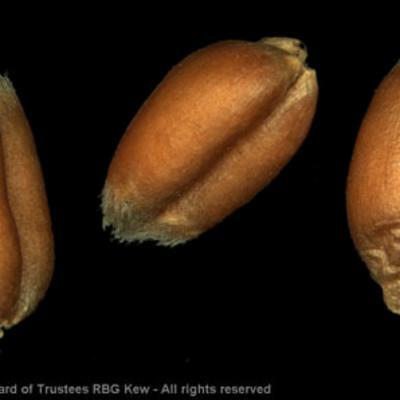 Wheat seeds are known for their potential longevity in storage: research indicates that for a sample starting ex situ life with maximum viability, it would take 900 years to fall to 75% viability. Common bread wheat can be seen growing in Kew's Grass Garden. Pressed and dried specimens of Triticum aestivum are held in Kew's Herbarium where they are available to researchers by appointment. 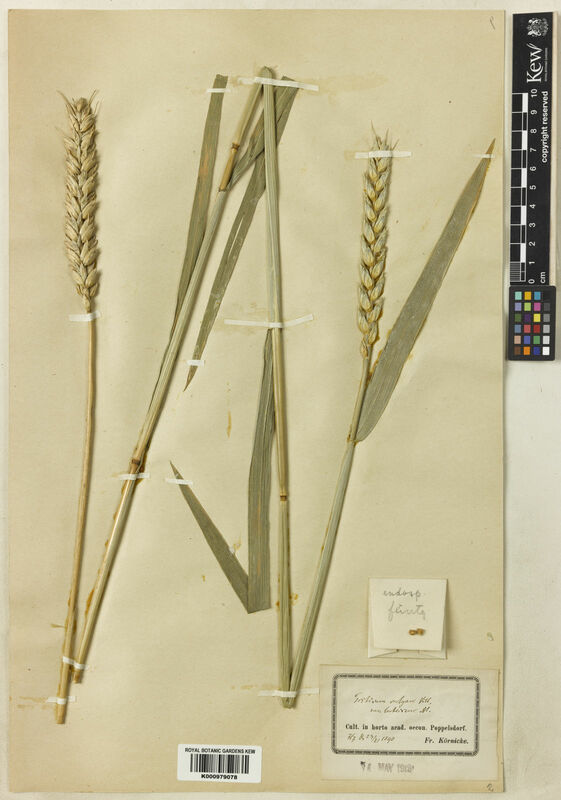 Details of specimens of other species of Triticum can be seen online in Kew's Herbarium Catalogue. 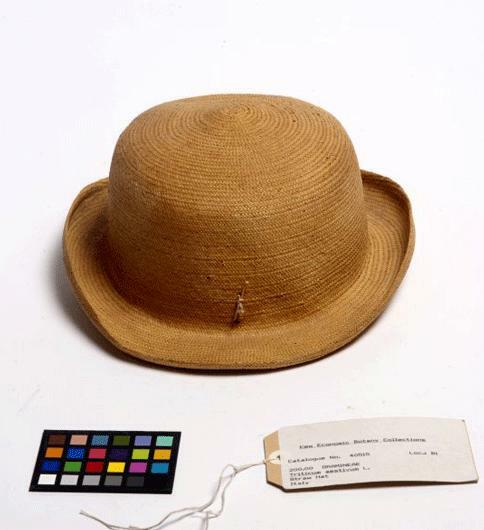 Triticum aestivum flowers, seeds and a straw hat, breakfast cereals and packaging material made from it are held in Kew's Economic Botany Collection, where they are available to researchers by appointment. Unknown in the wild; cultivated from the near-Arctic to the tropics. Wheat gluten allergy is a condition caused by an adverse immune system reaction to gliadin, a gluten protein found in wheat. Used for crafts (Linares 1994). Used to decorate wooden items (Linares et al. 2008). Food, drink, textiles, building materials. Oklahoma State University (2013). World Wheat Production. Wang, J., Luo, M. C., Chen, Z., You, F. M., Wei, Y., Zheng, Y. & Dvorak, J. (2013). Aegilops tauschii single nucleotide polymorphisms shed light on the origins of wheat D‐genome genetic diversity and pinpoint the geographic origin of hexaploid wheat. New Phytologist 198: 925–37. Dvorak, J., Deal, K. R., Luo, M. C., You, F. M., von Borstel, K. & Dehghani, H. (2012). The origin of spelt and free-threshing hexaploid wheat. Journal of Heredity 103: 426–441. Jaradat, A. A. (2011). 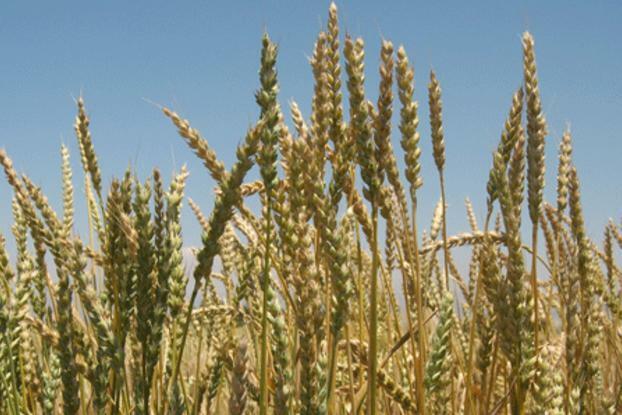 Wheat Landraces: Genetic Resources for Sustenance and Sustainability. USDA-ARS, Maine, USA. Mabberley, D. J. (2008). Mabberley’s Plant-book: a Portable Dictionary of Plants, their Classification and Uses. 3rd edition. Cambridge University Press, Cambridge, UK. Mac Key, J. (2005). Wheat: its concept, evolution, and taxonomy. In: Durum Wheat Breeding: Current Approaches and Future Strategies, C. Rojo, M. M. Nachit, N. Di Fonzo, W. H. Pfeiffer & G. A. Slater (eds), Food Products Press, Binghamton, New York, USA. Bettencourt, E. & Konopka, J. (1990). Directory of Germplasm Collections 3: Cereals (Avena , Hordeum , Millets, Oryza , Secale , Sorghum , Triticum , Zea and Pseudocereals). International Board for Plant Genetic Resources, Rome. Stubbs, R. W., Prescott, J. M., Saari, E. E. & Dubin, H. J. (1986). Cereal Disease Methodology Manual. Centro Internacional de Mejoramiento de Maíz y Trigo (CIMMYT). Hanelt, P., Schulze-Motel, J. & Jarvis, C. E. (1983). (715) Proposal to conserve Triticum aestivum L (1753) against Triticum hybernum L. (1753) (Gramineae). Taxon 32: 492–498. Löve, Á. (1982). Generic evolution of the wheatgrasses. Biologisches Zentralblatt 101: 199–212. Jonard, P. (1951). Les Blés Tendres Cultivés en France – Détermination et Caractéristiques Culturales. Institut National de la Recherche Agronomique (INRA), Paris. Schrank, F. von Paula (1789). Baierische Flora. Joh. Bapt. Strobl, München.